My Seafair marathon pacing experience was not as great as I would have liked it to be so I pined for another shot at redemption. After my sfx I was not sure if I will be able to ramp-up in time. After all this was a commitment I was making and I could not fail... Luckily, I noticed that I did maintain some of my fitness. After a test run on the Sat before, I was good to go. There was a "meet the pacers" segment at the Expo where I got to answer quite a few questions - most of them not related to pacing but it felt great to be able to help. I also met Dane in person for the first time. I had read a lot of his race reports and was looking forward to buying his new book. Too bad I could not get him to sign it since it was not out yet. I would also get to see him finish (as a 3:10 pacer) the next day. We could not have asked for a better November day for running - just perfect! As I waited with my pacer pole before the race I again got to answer a bunch of questions not related to pacing :) Glad to help. The pacer pole helped standout in the crowds at the start. 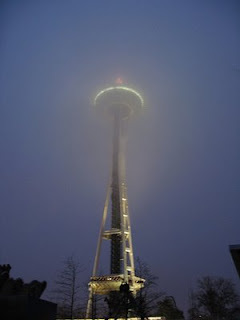 I thought the start at the backdrop of the Space Needle (which had a lighted Christmas tree) provided a great ambiance. Onto the I-90 bridge... I hoped my legs would be OK with the concrete. As per plan, the goal was to slow down during the hills... I had done so many long runs along this part of the course. At least that was counting for something. It was great that some runners thanked me for pacing as they passed... Nice of them to say so. I thanked them for running. Had words of encouragement for a couple of fading runners. The finish was in the Memorial stadium... Nice! As I approached the finish line I turned the pacer pole and waved it in celebration on a job mostly well done. At the finish someone thanked me for being there when they really need it. A lady indicated that my red shoes helped (didn't realize that :)). I shaked hands of some 1:45 finishers. This run meant more to me than a mere pacing gig. It felt good knowing that in a small way I helped some people run their race. Post-sfx, this was a small but important step towards being able to train for another marathon! In the journey of life we fall down several times. However, like a toddler learning to walk, it's important that we never give up! We have to get up and try to walk the roads of life with renewed vigour, wiser and smarter! This was an unusually busy week at work. As a result, I did not get a chance to run on Tuesday (and had to take the risk of running on successive days). I am sure if I were training for a race I would have "made" the time to get in my run. Both my weekday runs were in the dark on the Lk Sammamish trail - very peaceful and quiet, all alone. I now have a mini-goal to work on. 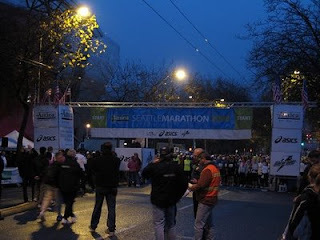 I got a gig to pace (as an official pacer) a leg at the Seattle marathon. So that's 6.5 miles at 8 min pace. So on Sat I wanted to make sure that I could do it. Thankfully, I still have some of my fitness and my leg held up well! It is critical to start back slowly and increase your mileage gradually to allow the final healing to take place. There is a danger during the first few weeks back of releasing your pent-up physical and emotional energy and overdoing it. After a stress fracture, you need to increase the workload slowly and allow enough rest for the bone to adapt. It will take several weeks before you are running far enough or hard enough to actually improve your cardiovascular fitness. It is important not to increase the distance, frequency, and intensity of your running all at the same time. In any given week, you can increase one or two, but not all three of these training variables. For the first several weeks, it is best to increase the distance and frequency of your runs, but to keep the intensity moderate. Initially, you should run every 3rd day or every other day. During this time it is important to avoid the factors that caused the injury in the first place. I was reminded about how uplifting running is for me. After my run today I am feeling so much more positive about things. I just looked at my depleted 401k balances and I am still smiling! After being cleared to get back by my doc I ran my first mile today. The thing that bothered me is that he did not base this decision based on any solid evidence (for instance from a X-ray). The injured area did not hurt but did not feel perfect either... I'll just have to keep monitoring signs and take more time off if necessary. This post is not running related except for the fact that the path of the incident has been part of my runs when I visit Valhalla, NY. I am sure I'll always be reminded of this event when I run there. On Tuesday night I was filled with euphoria as I listened to President elect, Obama’s victory speech. I was living in a nation where finally people were not “judged by the color of their skin, but by the content of their character.” These feelings dissipated on Friday when I was harassed by the Westchester police for no reason other than the fact that my skin was brown. On Friday morning, November 7th, 11am, I had missed my train from Valhalla to Grand Central so I decided to appreciate the beautiful fall day by walking to the North White Plains train station. I had a broken leg so I was walking slowly while taking pictures along the way. As I crossed the street to enter the Bronx River parkway trail I saw four police cars. To my surprise the police officers asked me to stop. They indicated that they had a report of a suspicious person taking pictures of the Kensico dam while hiding behind trees! I was amazed at how someone could file such a ridiculous report in a part of the country that is fairly cosmopolitan. Or is it? Sounds like someone returning from a Sarah Palin campaign rally. Within the first two minutes the officers examined the pictures on my camera and had realized that I had no incriminating shots. There was just one shot with a very distant and remotely visible view of the dam, covered for the most part with foliage. At this point the police should have realized their mistake and let me go on my way. However, they continued to harass me with questions and treat me as a criminal for the next thirty minutes. Some amongst the gamut of questions that I was asked by the police left me astonished. In a free country I was asked why I was walking with a broken leg. I was asked whether I broke my leg in NY or before coming here perhaps to insinuate that I was involved in a terrorist encounter. Like a criminal, I was asked to show the contents of my book bag to prove that I was carrying no weapons.When I showed my Washington state drivers license, I was asked if I had gotten this from the DMV. The validity of this document has never been questioned anywhere. In spite of showing my Microsoft Employee badge, an identity document from the world’s largest software company, I was asked if I had immigration documents to prove that I was in this country legally. I have tried to forget this incident since then but it keeps getting replayed in my mind. My vacation has been ruined and I keep asking myself several questions. Why did I have to go through this experience if I did nothing illegal? If the Dam Plaza is such an important resource, why wasn’t there a single police officer stationed there or signs clearly indicating that photography is not allowed even from a distance? Is this the way the Westchester police treat everyone taking pictures in the Dam Plaza? Terrorists would not entrust photography to a person with a broken foot and a point and shoot camera. Will the Westchester police be ready to apprehend people who intend to do real harm to the country when they are busy harassing innocent civilians? I was relieved when my plane landed at the Seattle Tacoma airport yesterday. I had returned to a part of the country where people do not use the tragedy of 9/11 to justify racism. We have a long way to go to realize Dr. King’s dream, when the people in a supposedly progressive part of the country are not able to look beyond the color of a person’s skin. The one positive of not getting to run the marathon this year was that I got to spectate with a bunch of forum east coasters (a nice FE!). I don't think I'll ever have the luxury of coming down from Seattle to watch the race again. Radcliffe led the lead woman's pack with Goucher not far behind. The elite men were in a tighter pack. We waited for Donna, Joe and John before heading to the Manhattan club en route the finish. As I watched the runners a whole gamut of thoughts went through my mind. I wished I was running this year. I though about how I would approach my comeback and running in general. Finally, I was inspired and determined to run next year. 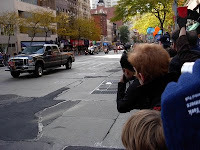 Looking forward to the New York marathon 2009 - the 40th anniversary!